The organization wants to rebuild the network so that the network load can be managed in an efficient manner and the newer technologies can be accommodated in the network. After acquiring the business goals for the organization it is very important that the network equipment is identified and gathered and the network technology service are designed. Additionally, the network protocols that are to be included in the network are to be allocated within the network. All the devices are to be connected according to the network requirements and the technical requirements. 1.Who are your main users who would be using the system? 2.Do you have any type of wireless access requirements? 3.Who would have all the access controls in the systems? 4.What are main activities that are to be performed in the system? 5.What are the additional features that is required by the system? 8.What is the bandwidth requirement in the network? 9.Do you need any further development in the network? 10.What is the download speed in the network? 11.What is the upload speed in the network? 12.How would evaluate the performance of the network? 2.What are the security concerns in the network? 3.Please provide some insight on the access control features in the network? 4.Is the data integrity maintained properly in the system? 5.Is the internet connectivity stable at all-time within the network? 2.Users: The common users in the system should be able to send and receive data packets within the network. 3.Finance Staffs: The network should be able to accommodate a sub network for the staffs of the finance department. 4.Marketing Staffs: The network should be able to accommodate a sub network for the staffs of the Marketing department. 5.Back end developers: The network should be able to accommodate a sub network for the staffs of the Backend Developers. 6.Front end developers: The network should be able to accommodate a sub network for the staffs of the Frontend Developers. Questionnaire:-A questionnaire is a research instrument consisting of a series of questions (or other types of prompts) for the purpose of gathering information from respondents. Questionnaires have advantages over some other types of surveys in that they are cheap, do not require as much effort from the questioner as verbal or telephone surveys, and often have standardized answers that make it simple to compile data. However, such standardized answers may frustrate users. Questionnaires are also sharply limited by the fact that respondents must be able to read the questions and respond to them. Thus, for some demographic groups conducting a survey by questionnaire may not be concrete. Interviews:-In the interview process the task of the designer is to make proper questions to the clients and the users of the system.The results of the interviews would provide the designers with very useful information about the development of the network. Meetings:-The designers of the system are required to fix a meeting with the clients of the Excelfior Ltd. organization. From, the meeting it can be inferred that the organization needs to have access control in the system which is to be devised and the network should also be accommodating the front end and the back end developers. Stakeholder Analysis:-The stakeholders’ analysis would provide the information about the stakeholders who are associated with the system and their contribution towards the system. Stakeholder analysis is taken to include stakeholder identification - figuring out who the stakeholders of the system are, however it is to be noted that the designer can separate the two very different processes. The whole process of stakeholder engagement (formerly more commonly known as stakeholder management) has five main steps: identify, analyse, plan, act, and review. When the designers analyse stakeholders, he gathers information and make hypotheses about their interests, needs, perceptions, priorities, preferences, authority, influence, power, and many other things. Feedback system:-The feedback system is to be used after the development of the system so that the designer would be able to make an update to the system after receiving proper feedback from the users. The design has been created using the main switch as the central peripheral device in the network and the network has been sub netted using the switches. The routers and the three other switches have been used for the development of the network in the system. 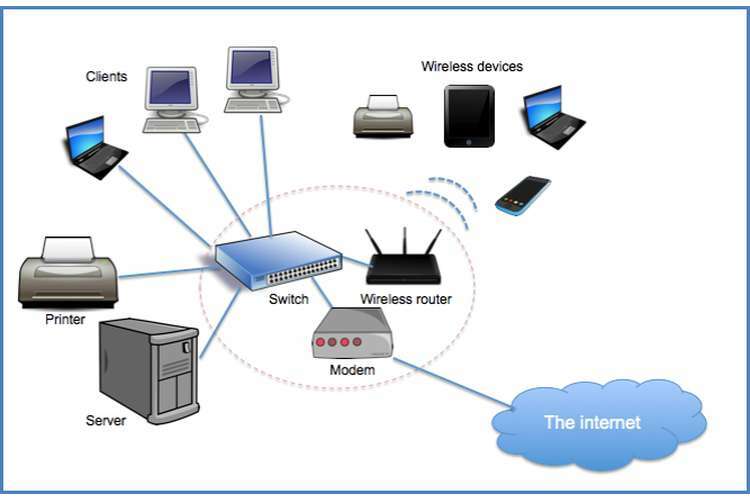 The admin router and the switch has been used for the development of the network around the administrator. The administrator sub network includes the internet access which is then circulated throughout the network. In addition to this the servers are also connected to the network and the also database access is circulated from this sub net. In addition to this, there are the finance strategic management department which is also assembled with the network. In addition to this, the access control is also managed by the administrator. The factors such as the packet delay, jitter, packet loss and network latency would be affecting the UDP-based Service quality to a great extent and also the other processes such as video streaming and VoIP. In the other hand the TCP-based services such as SMTP and HTTP helps in sending steady stream of data packets which is crucial in the case of VoIP connections. In case some slight connectivity problems would not be able to cause or echo. 9.Security controls are implemented correctly, operating as intended, and meeting the desired outcome. 1.Align with business goals and regulations. 1.Kreutz, D., Ramos, F.M., Verissimo, P.E., Rothenberg, C.E., Azodolmolky, S. and Uhlig, S., Software-defined networking: A comprehensive survey. Proceedings of the IEEE, 103(1), pp.14-76. 2015. 2.Nunes, B.A.A., Mendonca, M., Nguyen, X.N., Obraczka, K. and Turletti, T., A survey of software-defined networking: Past, present, and future of programmable networks. IEEE Communications Surveys & Tutorials, 16(3), pp.1617-1634. 2014. 3.Zhang, L., Afanasyev, A., Burke, J., Jacobson, V., Crowley, P., Papadopoulos, C., Wang, L. and Zhang, B., 2014. Named data networking. ACM SIGCOMM Computer Communication Review, 44(3), pp.66-73. 2014. 4.Xia, W., Wen, Y., Foh, C.H., Niyato, D. and Xie, H., A survey on software-defined networking. IEEE Communications Systems & Tutorials, 17(1), pp.27-51. 2015. 5.Quan, W., Xu, C., Vasilakos, A.V., Guan, J., Zhang, H. and Grieco, L.A., June. TB2F: Tree-bitmap and bloom-filter for a scalable and efficient name lookup in Content-Centric Networking. In Networking (pp. 1-9), 2014. 6.Fox, J. and Rooney, M.C., The Dark Triad and trait self-objectification as predictors of men’s use and self-presentation behaviors on social networking sites. Personality and Individual Differences, 76, pp.161-165. 2015. 7 Pathak, P.H., Feng, X., Hu, P. and Mohapatra, P., Visible light communication, networking, and sensing: A survey, potential and challenges. IEEE communications surveys & tutorials, 17(4), pp.2047-2077. 2015.